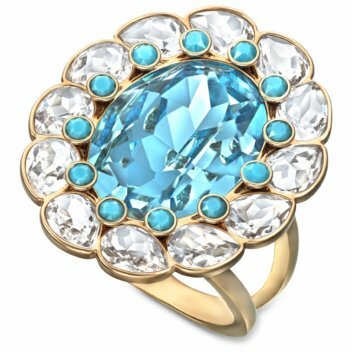 Scintillating in wonderful blue crystal colours, this beautiful cocktail ring in gold PVD metal offers a fresh touch. Mix and match with other Azore jewellery pieces for a fresh, fashionable look. A Swarovski piece purchased from Nicholls Online will come in its own beautiful presentation box and supplied with a certificate of authenticity. We will also do our best to package the item in its own Swarovski gift bag (subject to availability) - See and image to the left for an example of the gorgeous packaging.